On September 2, 1882, Kimberley was the first city in the Southern Hemisphere and the second in the world after Philadelphia, Pennsylvania in the United States to integrate electric street lights into its infrastructure. The first Stock Exchange in Africa was built in Kimberley, as early as 1881. In 1866, Erasmus Jacobs found a small brilliant pebble on the banks of the Orange River, on the farm De Kalk leased from local Griquas, near Hopetown, which was his father's farm. He showed the pebble to his father who sold it. The pebble was purchased from Jacobs by Schalk van Niekerk, who later sold it. It proved to be a 21.25-carat (4.3 g) diamond, and became known as the Eureka. Three years later, in 1869, an 83.5-carat (16.7 g) diamond, which became known as the Star of South Africa, was found nearby (29°3′S 23°58′E﻿ / ﻿29.050°S 23.967°E﻿ / -29.050; 23.967). This diamond was sold by van Niekerk for £11,200 and later resold in the London market for £25,000. Henry Richard Giddy recounted how Esau Damoense (or Damon), the cook for prospector Fleetwood Rawstone's "Red Cap Party", found diamonds in 1871 on Colesberg Kopje after he was sent there to dig as punishment. Rawstorne took the news to the nearby diggings of the De Beer brothers — his arrival there sparking off the famous "New Rush" which, as historian Brian Roberts puts it, was practically a stampede. Within a month 800 claims were cut into the hillock which were worked frenetically by two to three thousand men. As the land was lowered so the hillock became a mine – in time, the world-renowned Kimberley Mine. The Cape Colony, Transvaal, Orange Free State and the Griqua leader Nicolaas Waterboer all laid claim to the diamond fields. The Free State Boers in particular wanted the area as it lay inside the natural borders created by Orange and Vaal Rivers. Following the mediation that was overseen by the governor of Natal, the Keate Award went in favour of Waterboer, who placed himself under British protection. 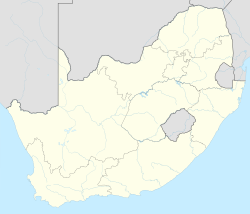 Consequently, the territory known as Griqualand West was proclaimed on 27 October 1871. As miners arrived in their thousands the hill disappeared and subsequently became known as the Big Hole (or Kimberley se Gat in Afrikaans) or, more formally, Kimberley Mine. From mid-July 1871 to 1914, 50,000 miners dug the hole with picks and shovels, yielding 2,722 kg of diamonds. The Big Hole has a surface of 17 hectares (42 acres) and is 463 metres wide. It was excavated to a depth of 240 m, but then partially infilled with debris reducing its depth to about 215 m; since then it has accumulated water to a depth of 40 m leaving 175 m visible. Beneath the surface, the Kimberley Mine underneath the Big Hole was mined to a depth of 1097 metres. A popular local myth claims that it is the largest hand-dug hole on the world, however Jagersfontein Mine appears to hold that record. The Big Hole is the principal feature of a May 2004 submission which placed "Kimberley Mines and associated early industries" on UNESCO's World Heritage Tentative Lists. Five big holes were dug into the earth following the kimberlite pipes, which are named after the town. Kimberlite is a diamond-bearing blue ground that sits below a yellow colored soil. The largest, The Kimberley mine or "Big Hole" covering 170,000 square metres (42 acres), reached a depth of 240 metres (790 ft) and yielded three tons of diamonds. The mine was closed in 1914, while three of the holes – Dutoitspan, Wesselton and Bultfontein – closed down in 2005. The Northern Cape Province became a political fact in 1994, with Kimberley as its capital. Some quasiprovincial infrastructure was in place from the 1940s, but in the post-1994 period Kimberley underwent considerable development as administrative departments were set up and housed for the governance of the new province. A Northern Cape Legislature was designed and situated to bridge the formerly divided city. The Kimberley City Council of the renamed Sol Plaatje Local Municipality (see below) was enlarged. A new Coat of Arms and Motto for the city were ushered in. Municipality — The Kimberley borough council assumed a coat of arms in 1878. The arms were registered with the Cape Provincial Administration in December 1964 and at the Bureau of Heraldry in February 1968. The design was a combination of the Union Jack and the charges from the Cape Colony's coat of arms, with a lozenge to represent the diamond-mining industry : Azure, a cross and saltire superimposed Gules both fimbriated Argent, in chief three bezants Or, each charged with a fleur de lis Azure, and in base three annulets Or; on a lozenge Or, superimposed over the fess point, a lion rampant Gules. The motto was "Spero meliora". Divisional council — The Kimberley divisional council, which administered the rural areas outside the city, registered its own arms at the Bureau in August 1970. The arms were: Per saltire, in chief, barry wavy of six Argent and Azure; in base, Argent, a pale Sable charged with three fusils Argent; dexter, Gules, a shovel and pick in saltire, handles downward, Or; sinister, a staff of Aesculapius, Or. In layman's terms, the shield was divided in four by two diagonal lines, and depicted (1) six silver and blue stripes with wavy edges, (2) a crossed pick and shovel on a red background, (3) a golden staff of Aesculapius, and (4) three silver diamond-shaped fusils on a black vertical stripe on a silver background. The crest was two crossed rifles in front of an upright sword; the supporters were two kudus; and the motto was "Nitanir semper ad optima". On 2 September 1882, Kimberley became the first town in the Southern Hemisphere to install electric street lighting. The rising importance of Kimberley led to one of the earliest South African and International Exhibitions to be staged in Kimberley in 1892. It was opened by Sir Henry Loch, the then Governor of the Cape of Good Hope on 8 September. It presented exhibits of art, an exhibition of paintings from the royal collection of Queen Victoria and mining machinery and implements amongst other items. The exhibition aroused considerable interest at international level, which resulted in a competition for display space. Under the Köppen system Kimberley has a semi-arid climate courtesy of its dry winters. Kimberley’s water is pumped from the Vaal River at Riverton, some 15 km north of the city. Galeshewe incl "Old No 2"
Education is a major sector in Kimberley's social and economic life. Qualitas Career Academy, (Nationally brand, private college). Offering full-time and part-time studies for students as well as corporate training and consulting services for businesses and government departments. The Sol Plaatje University opened in Kimberley in 2014, accommodating a modest initial intake of 135 students. Announcing the name for the university, President Jacob Zuma mentioned the development of academic niche areas that did not exist elsewhere, or were under-represented, in South Africa. "Given the rich heritage of Kimberley and the Northern Cape in general," Zuma said, "it is envisaged that Sol Plaatje will specialise in heritage studies, including interconnected academic fields such as museum management, archaeology, indigenous languages, and restoration architecture." Writers from the city or with strong Kimberley links include Diane Awerbuck, Benjamin Bennett, Lawrence Green, Dorian Haarhoff, Dan Jacobson, E P Lekhela, Z.K. Matthews, Sarah Gertrude Millin, Sol Plaatje, Frank Templeton Prince, Olive Schreiner, A.H.M. Scholtz. The William Humphreys Art Gallery. The Cenotaph erected originally to commemorate the fallen of World War I, with plaques added in memory of fallen Kimberley volunteers in World War II. There is a memorial dedicated to the Kimberley Cape Coloured Corps who died in the Battle of Square Hill during World War I. Consisting of a gun captured at the battle, it originally stood in Victoria Crescent, Malay Camp, but, post-1994, was moved to the Cenotaph. The Concentration Camp Memorial remembers those who were interned in the Kimberley concentration camp during the Second Boer War, and is located in front of the Dutch Reformed Mother Church. The city is served by both print media and community radio stations. The earliest newspaper here was the Diamond Field, published initially at Pniel on 15 October 1870. Other early papers with the Diamond News and the Independent. The Diamond Fields Advertiser is Kimberley's current daily newspaper, published since 23 March 1878. The Volksblad, with a free local supplement called Noordkaap, is read by Afrikaans-speaking readers. Kimberley has contributed to much of cricket's history having supplied several international players. There was Frank (Nipper) Nicholson, Xenophon Balaskas born in Kimberley to Greek parents and Ken Viljoen, Ronnie Draper and in more recent times Pat Symcox and the Proteas coach Mickey Arthur. Kimberley hosted a match from the 2003 ICC Cricket World Cup. Elsie McDonald was a Springbok bowler. Frank Dobbin known as Uncle Dobbin was a member of Paul Roos' original Springboks in the tour to the British Isles in 1906/1907. His memory lives in his old colonial-style home in Roper street, bearing a simple brass plaque with the name 'Dobbin'. Later Springboks to wear green and gold included Ian Kirkpatrick, Tommy Bedford and Gawie Visagie, brother of Ammosal-based Springbok flyhalf Piet Visagie. Kimberley is home to the Griquas rugby team, which has won the Currie Cup three times in 1899, 1911 and 1970. Ronnie Bauser an ex-mayor of Kimberley were involved in Griquas rugby for 1950-1971. Richard Henyekane, South African footballer, is from Kimberley, his younger brother Joseph played for Golden Arrows. Jimmy Tau is from Kimberley. Karen Muir, born in Kimberley, became in 1965 the youngest person to break a world record in any sport. This age group record stands to this day. She set it in August 1965 at the junior world champions in Blackpool, England in the 110 metres (360 ft) backstroke at the age of 12. She went on to break many more world records but was denied a role in world swimming when she lost the opportunity to represent her country at the 1968 Olympic games in Mexico City as a result of South Africa being excluded due to its racial apartheid policies. Kimberley also saw a world record broken in the municipal pool which now bears Karen Muir's name. It was Johannesburg's Anne Fairlie who beat Karen Muir and Frances Kikki Caron in world record breaking time. Charl Bouwer, the paralympic swimmer from South Africa who won gold in the 50m freestyle at the 2012 Summer Paralympics in London, was born in Kimberley. Prominent cyclists have been Joe Billett, Steve Viljoen and Eddie Fortune. Joe Billett qualified for the 1968 Olympics to be held in Mexico. Joe was the backbone of cycling in Kimberley for years to come and inspired cyclists like the Hendriks brothers and Hennie champ Schoeman. The first Maloof Money Cup World Skateboarding Championships were held in Kimberley in September 2011 and again in 2012. When the Maloof family sponsorship ended in 2013 the event became known as the Kimberley Diamond Cup. "Kimberley has had a profound effect on the course of history in Southern Africa. The discovery of diamonds there, more than a century ago, proved to be the first step in the transformation of South Africa from an agricultural into an industrial country. When gold and other minerals were later discovered to the north, there were already Kimberley men of vision and enterprise with the capital and technology to develop the new resources." - H.F. Oppenheimer, 1976. Foreword to Brian Roberts’ book, Kimberley, turbulent city. Anthony Trollope visited Kimberley in 1877 and was notoriously put off by the heat, enervating and hideous, while the dust and the flies of the early mining town almost drove him mad: "I sometimes thought that the people of Kimberley were proud of their flies and their dust." Of the townscape, largely built of sun-dried brick, and of plank and canvas and corrugated iron sheets brought up by ox-wagon from the coast, he remarked: "In Kimberley there are two buildings with a storey above the ground, and one of these is in the square: this is its only magnificence. There is no pavement. The roadway is all dust and holes. There is a market place in the midst which certainly is not magnificent. Around are the corrugated iron shops of the ordinary dealers in provisions. An uglier place I do not know how to imagine." A.H.J. Bourne, a former headmaster of Kimberley Boys' High School, returned to the city in 1937, observing that: "The history of Kimberley would appear remarkable to any stranger who could not fail to think that some supermind was behind its destinies. In so short a time it has grown from bare veld." In the early 1990s writer Dan Jacobson returned to Kimberley, where he had grown up in the 1930s, giving a sense of how things had changed: "The people I had known had vanished; so had their language. That contributed to my ghostlike state. In my earliest years the whites of Kimberley spoke English only; Afrikaans was the tongue of the Cape Coloured people ... Now I was addressed in Afrikaans everywhere I went, by white, black, and Coloured alike". Kimberley dull? – asked virtualtourist reviewer Catherine Reichardt: "Happily, the answer is a resounding 'No', provided that you have a passion for history - in which case Kimberley has it in spades, and you'll probably need to overnight to fully appreciate its attractions and charms. In many ways, exploring Kimberley and its heritage is like experiencing South African history in microcosm." The Kimberley Process Certification Scheme (KPCS) is an initiative for preventing trade in "conflict diamonds" used to finance the undermining of legitimate governments. It was founded in 2003, following a May 2000 meeting of Southern African diamond-producing states in Kimberley. A tenth anniversary meeting of the Kimberley Process was held at the Mittah Seperepere Convention Centre, Kimberley, on 4--7 June 2013, bringing together representatives of Governments, the diamond industry and civil society. A commemorative event was held at the Kimberley Tabernacle, the venue for the original meeting of the KPCS, where 23 individuals present at the very first meeting were honoured for their involvement. South African Minister of Mineral Resources, Susan Shabangu, addressed the closing session, noting the role of the KPCS in minimising "blood diamond" trade, as well as its "significant developmental impact in improving the lives of people dependent on the trade in diamonds." ^ a b c d Sum of the Main Places Roodepan, Galeshewe and Kimberley from Census 2011. ^ "17 Things You Didn't Know Were Invented By South Africans". AFKInsider. 9 February 2017. Retrieved 9 September 2017. ^ a b Martin Meredith (2007). Diamonds, Gold, and War: The British, the Boers, and the Making of South Africa. New York: Public affairs. p. 16. ISBN 1-58648-473-7. ^ Wilson, A.N. (1982). Diamonds : from birth to eternity. Santa Monica, California: Gemological Institute of America. p. 135. ISBN 0873110102. ^ Chilvers, Henry (1939). The Story of De Beers. Cassell. pp. 23–24. ^ Ralph, Julia (1900). Towards Pretoria; a record of the war between Briton and Boer, to the relief of Kimberley. Frederick A. Stokes company. ^ Select Constitutional Documents Illustrating South African History 1795-1910. Routledge and Sons. 1918. p. 66. ^ Roberts, Brian. 1976. Kimberley, turbulent city. Cape Town: David Philip, p. 155. ^ Hannatjie van der Merwe (20 May 2005). "Big Hole loses claim to fame". News24. Archived from the original on 7 January 2009. Retrieved 21 October 2008. ^ "Anglo American: De Beers investor presentation" (PDF). Anglo American. Retrieved 19 February 2015. ^ Sessional Papers By Great Britain Parliament. House of Commons. 1902. ^ Anonymous (16 March 2011). "Mayibuye Uprising-black South Africans, slaves in the land of their birth, rose up to peacefully throw off their shackles". South African History Online. Retrieved 9 September 2017. ^ 'Local and General' in The Diamond News and Griqualand West Government Gazette (16 May 1878). ^ The arms are depicted on an illuminated address presented to governor Sir Bartle Frere in 1879 and one presented to governor Sir Henry Brougham Loch in 1890. ^ Cape of Good Hope Official Gazette 3270 (18 December 1964). ^ The arms were depicted on a cigarette card issued in 1931. ^ a b Brian Roberts (1976). Kimberley. D. Philip, Historical Society of Kimberley and the Northern Cape. ISBN 0-949968-62-5. ^ Morris, Michael; Linnegar, John (2004). Every Step of the Way. Human Sciences Research Council. ISBN 0-7969-2061-3. ^ Christie, Renfrew (1984). Electricity, Industry and Class in South Africa. London: The Macmillan Press Ltd. pp. 5–6. ^ Conradie, S. R.; Messerschmidt, L. J. M. (2000). A Symphony of Power: The Eskom Story. Johannesburg: Chris van Rensburg Publications. p. 13. ^ Becker, Dave (1991). On Wings of Eagles: South Africa's Military Aviation History (1 ed.). Durban: Walker-Ramus Trading Co. p. 9. ISBN 0-947478-47-7. ^ "Kimberley Climate Normals 1961−1990". National Oceanic and Atmospheric Administration. Retrieved 29 November 2013. ^ "Klimatafel von Kimberley, Provinz Northern Cape / Südafrika" (PDF). Baseline climate means (1961-1990) from stations all over the world (in German). Deutscher Wetterdienst. Retrieved 7 February 2016. ^ "Station Kimberley" (in French). Meteo Climat. Retrieved 19 November 2016. ^ a b "Climate data for Kimberley". South African Weather Service. Archived from the original on 4 March 2012. Retrieved 7 March 2010. 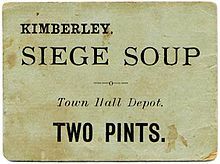 ^ "Main Place Kimberley". Census 2011. ^ "Main Place Galeshewe". Census 2011. ^ "Main Place Roodepan". Census 2011. ^ "Adamantia". Retrieved 27 May 2018. ^ "Diamantveld". Retrieved 27 May 2018. ^ "Floors". Retrieved 27 May 2018. ^ "Greenpoint". Retrieved 27 May 2018. ^ "Homevale Secondary". Retrieved 27 May 2018. ^ "HTS Kimberley". Retrieved 27 May 2018. ^ "Kimberley Boys". Retrieved 27 May 2018. ^ "Kimberley Girls'". Retrieved 27 May 2018. ^ "Northern Cape". Retrieved 27 May 2018. ^ "St. Boniface". Retrieved 27 May 2018. ^ "St Patricks Christian Brothers College". Retrieved 27 May 2018. ^ "William Pescod". Retrieved 27 May 2018. ^ "SA: Jacob Zuma: Address by the President of South Africa, during the announcement of new Interim Councils and names of the new universities, Union Buildings, Pretoria (25/07/2013)". Polity.org.za. Retrieved 9 September 2017. ^ "TimesLIVE". www.timeslive.co.za. Retrieved 9 September 2017. ^ "Home | New Universities | DHET New Universities Project Management Team". www.newuniversities.ac.za. Archived from the original on 9 September 2017. Retrieved 9 September 2017. 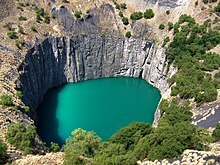 ^ "The Big Hole | De Beers | Kimberley". www.thebighole.co.za. Archived from the original on 21 September 2017. Retrieved 9 September 2017. ^ "William Humphreys Art Gallery". www.whag.co.za. Retrieved 9 September 2017. ^ Tidy, Major D.P. "They Mounted up as Eagles (A brief tribute to the South African Air Force)". 5 (6). The South African Military History Society. Archived from the original on 2 February 2009. ^ "The History of Aviation in South Africa". South African Power Flying Association. Archived from the original on 23 March 2009. Retrieved 22 July 2009. ^ "Dutch Reformed Mother Church Newton". South African Heritage Resources Agency. Archived from the original on 4 July 2011. Retrieved 22 July 2009. ^ "First Seventh Day Adventist Church Blacking Street Kimberley". South African Heritage Resources Agency. Archived from the original on 4 July 2011. Retrieved 22 July 2009. ^ du Toit, Anneke (10 September 2008). "A lot of news, a lot of newspapers". Volksblad. Archived from the original on 7 April 2015. Retrieved 7 April 2015. ^ Coetzee, G. (29 December 2017). "Groot gees van Griekwa rugby sterf in Kimberley". Die Burger Newspaper. Retrieved 15 October 2018. ^ "Volksblad". Netwerk24. Retrieved 9 September 2017. ^ "African Skate Project". African Skate Project. Retrieved 9 September 2017. ^ "VirtualTourist.com ceased operations". members.virtualtourist.com. Retrieved 9 September 2017. ^ Kimberley Process Certification Scheme (KPCS) Intersessional Meeting ends with review on processes and functions Accessed 7 June 2013. Wikivoyage has a travel guide for Kimberley (Northern Cape). 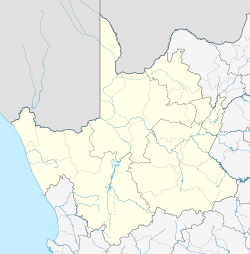 Wikimedia Commons has media related to Kimberley (South Africa). Wikisource has the text of the 1911 Encyclopædia Britannica article Kimberley.